The capital of Kenya is a formidable, modern African city of over three million people. At almost 6,000 foot elevation the city has a comfortable subtropical climate. Your visit includes a visit to The David Sheldrick Wildlife Trust's Elephant Orphanage, famous for its work with orphaned elephants, as well as Giraffe Centre where you come face to face with the Rothschild giraffe. 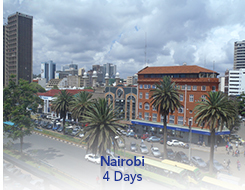 Arrive Nairobi, where you are met and transferred to your hotel.